Animal Kids Camp is our day camp for kids who love animals. We offer camp in the summer and during the local winter and spring breaks. If your kids want to spend time with animals and learn even more about them, this camp is for them! 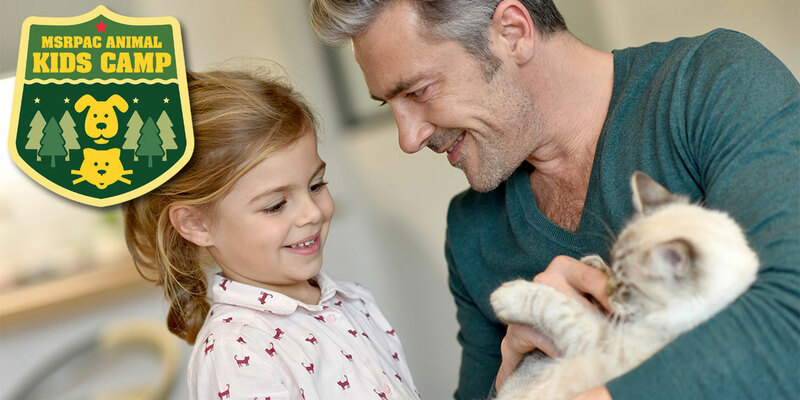 Spend hands-on time with our pet adoption center cats, dogs, puppies, and kittens. Learn fun and new facts about our animals. Participate in animal-themed crafts, activities, and games. Hear from fantastic guest speakers who work with animals. Make new friends who love what you love – the animals, of course! • Now offering three weeks of Summer Animal Kids Camp. Each week will be of a different topic. • All camp sessions are held at our Mary S. Roberts Pet Adoption Center location. • Registration is on a first come, first served basis. • The camp is for children ages 5-13. Summer Camp Session is OPEN! Hello, MSRPAC Kid Campers and families! Are you ready for a hands-on humane adventure, teaching kindness, mindfulness, social responsibility, and compassion? To ensure that you have a fabulous, Animal Kids Camp experience this year, please read these tips and expectations. Animal Kids Camp is held at 6165 Industrial Ave, Riverside, CA 92504. Drop-off and pick-up will be in our covered activity yard. All Campers must wear a Kids Camp T-shirt (provided on the first day of camp; Animal Kids Camp shirts from prior years also permitted), socks and closed-toe shoes with rubber soles (no sandals, Crocs, or dress shoes), and pants that extend past the knee. Depending on the day’s activities, Campers not wearing appropriate pants and footwear may not be able to participate or may be sent home. Campers should dress for active stretching and sometimes messy activities. Please apply sunscreen before Camp, as we will be both inside and outside during the day. For safety reasons, please do not wear dangling jewelry. Campers will put on their name tag each day upon arrival. We ask that all campers bring a labeled reusable water bottle and their lunch. Refrigeration is not available for lunches, so please pack with an ice pack. Please label all belongings and clothing with your Camper’s name or initials. Children are encouraged to bring photos of any current or past pets for sharing and may be asked to bring in project items (such as shoe boxes for critter crafts). Please DO NOT BRING anything of value to Camp (including cell phones, cameras, toys, video games, or iPods) or any large items (backpacks, coolers, anything bulky), since storage is very limited. Phones will be stored in a locker and returned at the end of the day; Campers are not permitted to use them during Camp activities, including lunch. MSRPAC is not responsible for any damaged, lost or stolen items. Animal Kids Camp is Monday through Thursday, 9 am – 12 or 1 pm with the exception of days and hours being changed for our Winter Animal Kids Camp (see Winter Camp Hours at top of the page). We do not currently provide before or aftercare—there is no supervision available before 9 am or after 1:10 pm. All Campers participating in the day’s activities must be at MSRPAC between 9 - 9:10 am. Please pick up your Camper promptly, between 1 -1:10 pm. The parent/guardian (or those individuals designated on your registration form) must sign your Camper in and out each day and may be asked to show identification. If you know you will need to attend Animal Kids Camp for a shortened day, please make prior arrangements with the Community Education Coordinator. Lunch is not included for Winter camp session. Please have your child bring their own lunch. Will Campers spend time with shelter animals? Yes. Camp includes interactions with our center residents, but that is only one part of the camp experience. Kids Camp also includes lots of other animal-related activities, such as special guest speakers and visiting animals, critter crafts, learning activities, games, and service projects for the animals. Time in our adoption center is limited, closely monitored, and restricted as necessary to ensure the safety of all animals and Campers. Students will have daily opportunities for contact with a variety of animals, including shelter animals and visiting guests, but should not expect to spend significant time with animals waiting for adoption. What are the behavior expectations for Camp? While at Camp, all students are expected to treat other Campers, Volunteers, MSRPAC staff, and animals with respect and kindness. Behavior expectations for all participants will be reviewed with Campers on the first day of each Camp session, but please go over them at home first. Since Campers will be around animals, it is imperative that they listen to and follow all instructions given by staff and Volunteers. If your child has difficulty following verbal or written instructions, they may not be a good match for Kids Camp. Campers who are consistently unable to follow these guidelines may be asked to leave Camp for the day or may be dismissed for the remainder of the session. No refunds will be available to campers who are dismissed for behavioral reasons. We have a zero-tolerance policy regarding fighting, bullying, and put-downs, theft or vandalism, or harmful treatment of animals. Acts of this nature are grounds for immediate dismissal from the Kids Camp session.